Robert Echols, “Giuseppe Caletti/Portrait of a Man as Saint George/c. 1620s,” Italian Paintings of the Sixteenth Century, NGA Online Editions, https://purl.org/nga/collection/artobject/239 (accessed April 21, 2019). The inclusion of a dragon in this intriguing painting suggests that the subject references Saint George, who according to legend tamed and slayed a dragon. However, the specificity with which the features of the sitter are represented indicates that the painting is a portrait. The man’s identity is unclear. A helmet rests near him. The flag’s design is that of the battle flag of the Order of the Knights of Malta. Contrasting with the heroic narrative suggested by these accoutrements are the elegant, decorative costume of the subject, his slender form, and his inscrutable expression. The attribution of the painting has been the subject of considerable debate and has evoked the names of several major Italian artists of the 16th century, among them Jacopo Tintoretto (Venetian, 1518 or 1519 - 1594) and Dosso Dossi (Ferrarese, active 1512 - 1542). The picture’s puzzling combination of qualities, which has led to such diverse attributions, may be best understood as the “retrospective romanticism” of a 17th-century artist looking back to Giorgione (Venetian, 1477/1478 - 1510) and Dosso through the lens of later painters. The most likely such artist is the 17th-century painter and printmaker Giuseppe Caletti, who was active from about 1620 until 1660. Caletti often deliberately worked in the styles of Dosso and the great Venetians. The National Gallery of Art painting shows especially striking similarities to some of Caletti’s etchings. NGA Board approval October 4, 1984. The title The Standard Bearer was adopted on February 1, 1941; previously, from the time of acquisition, it was known as Portrait of a Man with a Flag. However, questions have remained about both the attribution and the subject. The medal holding the plumes on the sitter’s cap appears to depict a reclining, clothed female figure. Nothing further can be determined of its subject. See Yvonne Hackenbroch, Enseignes (Florence, 1996), 124. Rearick compared the Gallery’s painting to the Madonna and Child Enthroned with Saints Sebastian, Roch, and Two Bishop Saints (Gemäldegalerie, Akademie der Bildenden Kunst, Vienna), which has been tentatively attributed to Mirola. W. R. Rearick, “Reflections on Tintoretto as a Portraitist,” Artibus et Historiae 16, no. 31 (1995): 58–59. On Tintoretto’s conservatism as a portraitist, see Miguel Falomir, “Tintoretto’s Portraiture,” in Tintoretto, ed. Miguel Falomir (Madrid, 2007), 98; and Frederick Ilchman, “The Titian Formula,” in Titian, Tintoretto, Veronese: Rivals in Renaissance Venice (Boston, 2009), 206. 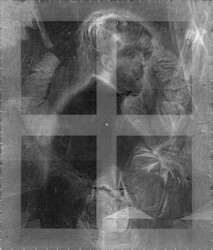 Contrary to Shapley, the portrait visible in the x-radiograph also shows a different, much more careful, controlled technique from that in Tintoretto’s portraits, such as A Procurator of Saint Mark’s (National Gallery of Art, 1952.5.79), where one can see the artist building up the skeletal structure of the head with bold, broad brushstrokes as he roughs the forms in. Shapley’s suggestion that the Gallery’s painting and the x-radiograph both show a similarity to Tintoretto’s self-portraits is equally unconvincing. See Fern Rusk Shapley, Catalogue of the Italian Paintings (Washington, DC, 1979), 1:463. The approach to the subject does show some characteristics of Dosso, evoking such works as Saint George (J. Paul Getty Museum, Los Angeles) [fig. 3] [fig. 3] Dosso Dossi, Saint George, c. 1513/1515, oil on panel, J. Paul Getty Museum, Los Angeles and the Standard Bearer (Allentown Art Museum). However, the Gallery’s painting is more delicate, the mood more pensive, closer to the elusive Giorgione than to the straightforward and less graceful Dosso. While the elegance and slender form of the figure are evocative of the portraits of Niccolò dell’Abate, such as the Man with Parrot (Kunsthistorisches Museum, Vienna), the pictorial technique is softer and more diffuse than Niccolò’s tightly focused precision. Niccolò’s physiognomies also tend to be more mannered and his colors more metallic than in the Gallery’s painting. Rearick’s attribution to Mirola has the appeal of accounting for the Emilian characteristics of the picture, but the relationship to Mirola’s firmly attributed works is too distant to be the basis of an attribution. Creighton Gilbert mentioned the Washington painting only peripherally, noting that Fiocco agreed that there was a romantic revival of Dosso c. 1600, “personified by Giorgio Calletti [sic] to whom he attributes the Washington Standard Bearer generally considered Dosso’s.” Gilbert agreed that the Gallery’s painting is closely based on Dosso but found the connection to Caletti’s documented work “less clear.” See Creighton Gilbert, The Works of Girolamo Savoldo: The 1955 Dissertation with a Review of Research, 1955–1985 (New York and London, 1986), 476–477. The mistake about Caletti’s name was repeated by Fern Rusk Shapley, Catalogue of the Italian Paintings (Washington, DC, 1979), 1:463. Tietze and Tietze-Conrat, in the undated manuscript opinion in NGA curatorial files (also cited by Shapley), described the Gallery’s picture as “almost a companion piece” to the portrait of a man in a plumed hat attributed to Pietro della Vecchia (see Alberto Riccoboni, Quattrocento pitture inedite: Prima mostra Nazionale Antiquaria [Venice, 1947], no. 77). “[S]canning Tintoretto’s, and incidentally Dosso’s oeuvre,” they wrote, “we look in vain for such a complicated posture . . . for such an ornamental filling of space, for such retrospective romanticism.” Pietro della Vecchia’s technique is generally more fluid, his colors more saturated, and his chiaroscuro more dramatic than in the Gallery’s painting. 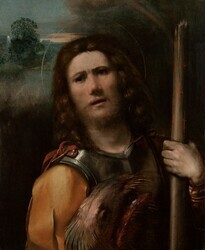 Nevertheless, the pose and “retrospective romanticism” of the Portrait of a Man as Saint George are indeed similar to some of Pietro’s paintings. See, for example, the Portrait of a Philosopher (Chrysler Museum of Art, Norfolk, VA) and the Warrior Attacking a Youth (Galleria Doria Pamphili, Rome); in addition, the Standard Bearer (or Warrior with a Shield and Lance), known from the mezzotint by Prince Rupert of the Rhine, provides a particularly apt comparison. Bernard Aikema, Pietro della Vecchia and the Heritage of the Renaissance in Venice (Florence, 1990), 116–117, 148, 160; cat. nos. I.10, I.202, IV.3; figs. 56, 89, and 104. On Caletti, see Nicola Ivanoff, “Giuseppe Caletti detto il Cremonese,” Emporium 57 (1951): 73–78; Eugenio Riccòmini, Il Seicento ferrarese (Ferrara, 1969), 41–47; Nicholas Turner, “Some Drawings by Giuseppe Caletti, called il Cremonese,” in Scritti di storia d’arte in onore di Federico Zeri (Milan, 1984), 2:681–688; Valeria Barboni and Enrico Cortina, “A Booklet of Etchings by Giuseppe Caletti,” Print Quarterly 13 (1996): 127–135. Early works by Guercino that share a somewhat similar pensive mood with the Washington picture include Et in Arcadia Ego (Galleria Nazionale d’Arte, Rome; 1618–1622) and the Return of the Prodigal Son (Kunsthistorisches Museum, Vienna; 1619). A figure in the latter was adopted for a David in a picture attributed to Caletti (Museo Civico, Ferrara). Altobello Melone’s Portrait of a Young Man (Harvard Art Museum/ Fogg Museum; c. 1527–1528) shows a sitter who similarly looks off into the distance. Caletti’s oeuvre as a painter may not yet be fully understood, and it is possible that further study may provide confirmation for this attribution. (For example, no portraits have yet been attributed to him.) In any case, the picture can be assigned more generally to a painter from the era of Guercino seeking to evoke the spirit of Dosso and other artists of the previous century. A date of circa 1620 to 1630 seems reasonable, since all of Caletti’s etchings mentioned above appear in a book published in the second half of the 1620s. The iconography of the picture remains ambiguous. Aside from the banner, there is no other indication that the sitter might be a Knight of Malta. The dragon suggests a reference to Saint George; perhaps the sitter was named Giorgio. Alternatively, if the picture did indeed have a Ferrarese origin, the fact that Saint George is the patron saint of Ferrara may have some connection to its subject. The overall mood of the picture, evoking Venetian and Ferrarese painting of a century before, may have been more important to the artist and patron than any specific references. (Count Alessandro Contini-Bonacossi, Rome); sold March 1932 to the Samuel H. Kress Foundation, New York; gift 1937 to NGA. The first reference to the painting, in a letter by Roberto Longhi of 1929, a copy of which is in NGA curatorial files, does not mention the painting’s location, although Longhi’s opinion may have been solicited by Contini-Bonacossi. The bill of sale that includes the painting, which is listed as Portrait of a Man with Flag by Jacopo Tintoretto, is dated 4 March 1932; copy in NGA curatorial files. A handwritten annotation reads "on records as: Dosso Dossi or Jacopo Tintoretto or Francisco Mazzola." An Exhibition of Italian Paintings Lent by Mr. Samuel H. Kress of New York to Museums, Colleges, and Art Associations, travelling exhibition, 24 venues, 1932-1935, mostly unnumbered catalogues, p. 40 or p. 45, repro., as Portrait of a Man with a Flag by Dossi. Exhibition of Venetian Painting From the Fifteenth Century through the Eighteenth Century, California Palace of the Legion of Honor, San Francisco, June-July 1938, no. 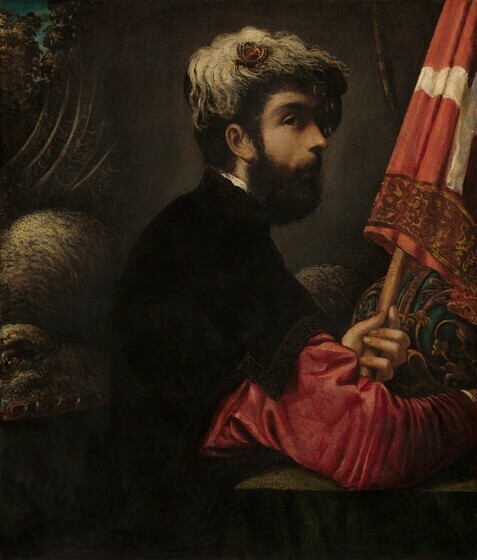 24, repro., as Portrait of a Man with a Flag by Dosso Dossi. Special Exhibition of Venetian Paintings from the Samuel H. Kress Collection, Seattle Art Museum; Portland Art Museum, Oregon; Montgomery Museum of Fine Arts, Alabama, August-October 1938, no catalogue. Jacopo Tintoretto--I Ritratti [Jacopo Tintoretto: Portraits], Gallerie dell'Accademia, Venice; Kunsthistorisches Museum, Vienna, 1994, no. 5, repro. Infrared reflectography was performed with a Santa Barbara Focalplane InSb camera fitted with an H astronomy filter. and the x-radiographs show that originally the feathers of the sitter’s hat were taller and extended down the back of his head to the nape of his neck. They also show that originally there was a curtain where the flag is located. Perhaps most significantly, the x-radiographs reveal the presence of another, nearly complete portrait beneath the present one, oriented in the opposite direction [fig. 1] [fig. 1] X-radiograph, Attributed to Giuseppe Caletti, Portrait of a Man as Saint George, c. 1620s, oil on canvas, National Gallery of Art, Washington, Samuel H. Kress Collection. Based on the x-radiographs, the handling of the paint in the portrait, especially in the treatment of the drapery, appears to be similar to that in the visible picture. The paint layers are generally thin, with some impasto only in a few highlights. Transparent glazes were applied over white underpainting to create the bright reds and greens. The decorations on the banner are heightened with gold leaf. The texture of the paint has been flattened, probably as a result of excessive pressure during lining. Thin, branched cracks with small areas of loss at the junction are visible in normal light. There are numerous small areas of retouching throughout the painting. The largest areas of retouching appear around the head in the background, in the beard, along the junction of the cloak and sleeve, and on the lower edge of the cloak. The entire picture suffers from abrasion. The flatness and opacity of the dark cloak suggest that it may have been repainted. Overall, the varnish is discolored and cloudy. The painting was treated by Stephen Pichetto in 1932. Berenson, Bernard. Pitture italiane del rinascimento: catalogo dei principali artisti e delle loro opere con un indice dei luoghi. Translated by Emilio Cecchi. Milan, 1936: 151, as by Dosso Dossi. Suida, Wilhelm. "Die Sammlung Kress: New York." Pantheon 26 (1940): 278, 280, repro., as by Tintoretto. Preliminary Catalogue of Paintings and Sculpture. National Gallery of Art, Washington, 1941: 58, no. 209, as The Standard Bearer by Dosso Dossi. Bercken, Erich von der. 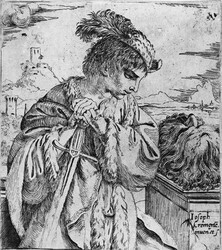 Die Gemälde des Jacopo Tintoretto. Munich, 1942: 148, as by Tintoretto. Book of Illustrations. National Gallery of Art, Washington, 1942: 243, repro. 99, as The Standard Bearer by Dosso Dossi. Paintings and Sculpture from the Kress Collection. National Gallery of Art, Washington, 1945 (reprinted 1947, 1949): 124, repro., as The Standard Bearer by Dosso Dossi. Longhi, Roberto. Viatico per cinque secoli di pittura veneziana. Florence, 1946: 67, as by Tintoretto. Pallucchini, Rodolfo. La giovinezza del Tintoretto. Milan, 1950: 107, fig. 182, as by Tintoretto. Morassi, Antonio. “Review of La giovinezza del Tintoretto, by Rodolfo Pallucchini.” Emporium 115 (1952): 240. Arslan, Edoardo. “Una Natività di Dosso Dossi.” Commentari 8 (1957): 260, as by Dosso Dossi. Paintings and Sculpture from the Samuel H. Kress Collection. National Gallery of Art, Washington, 1959: 170, repro., as The Standard Bearer by Dosso Dossi. Mezzetti, Amalia. Dosso e Battista Ferraresi. Ferrara, 1965: 124, as by Tintoretto. Summary Catalogue of European Paintings and Sculpture. National Gallery of Art, Washington, 1965: 43, as The Standard Bearer by Dosso Dossi. European Paintings and Sculpture, Illustrations. National Gallery of Art, Washington, 1968: 36, repro., as The Standard Bearer by Dosso Dossi. Gibbons, Felton. Dosso and Battista Dossi: Court Painters at Ferrara. Princeton, 1968: 263-264, fig. 222, as by Nicolò dell’Abbate. Shapley, Fern Rusk. Paintings from the Samuel H. Kress Collection: Italian Schools, XV-XVI Century. London, 1968: 75-76, fig. 182, asThe Standard Bearer, Attributed to Dosso Dossi. Béguin, Sylvie, ed. Mostra di Nicolò dell'Abate. Exh. cat. Palazzo dell'archiginnasio, Bologna, 1969: 78, as by Tintoretto. Rossi, Paola. “Una recente pubblicazione sul Tintoretto e il problema della sua ritrattistica.” Arte Veneta 23 (1969): 266, as by Tintoretto. Zeri, Federico. "Review of Paintings from the Samuel H. Kress Collection. Italian Schools XV-XVI Century by Fern Rusk Shapley." The Burlington Magazine 111 (1969): 456. Béguin, Sylvie. "Review of Dosso and Battista Dossi: Court Painters at Ferrara, by Felton Gibbons." L' Oeil 183 (1970): 59, as by Tintoretto. Richardson, Francis. “Review of Dosso and Battista Dossi, Court Painters at Ferrara, by Felton Gibbons.” Art Quarterly 33, no. 3 (1970): 310, as by Nicolò dell’Abbate. Béguin, Sylvie. “Nicolo dell'Abate: étude radiographique.” Annales - Laboratoire de Recherche des Musées de France (1971): 59-61, repro. 60 and fig. 19, as by Tintoretto. Fredericksen, Burton B., and Federico Zeri. Census of Pre-Nineteenth Century Italian Paintings in North American Public Collections. Cambridge, Mass., 1972: 201, as by Tintoretto. Shapley, Fern Rusk. Paintings from the Samuel H. Kress Collection: Italian Schools, XVI-XVIII Century. London, 1973: 390-391, as Attributed to Dosso Dossi. Rossi, Paola. Jacopo Tintoretto: I ritratti. Venice, 1974: 25-26, 44, 130-131, fig. 21, as by Tintoretto. European Paintings: An Illustrated Summary Catalogue. National Gallery of Art, Washington, 1975: 110, repro., as The Standard Bearer by Dosso Dossi. Shapley, Fern Rusk. Catalogue of the Italian Paintings. 2 vols. Washington, 1979: I:462-464, II:pl. 330, 330A,B, as Self Portrait (?) as Saint George by Jacopo Tintoretto. European Paintings: An Illustrated Catalogue. National Gallery of Art, Washington, 1985: 391, repro., as by Jacopo Tintoretto. Gilbert, Creighton. The Works of Girolamo Savoldo. The 1955 Dissertation with a Review of Research, 1955–1985. New York and London, 1986: 476-477, as by Dosso Dossi revival, c. 1600. Rossi, Paola. “Paris Bordon e Jacopo Tintoretto.” In Paris Bordon e il suo tempo: atti del convegno internazionale di studi, Treviso, 28–30 ottobre 1985. Treviso, 1987: 29, as by Tintoretto. Martini, Egidio. “Alcuni ritratti e altri dipinti di Jacopo Tintoretto.” Arte documento 5 (1991): 107, note 6, as by Nicolò dell’Abbate. Rearick, W. R. “Reflections on Tintoretto as a Portraitist.” Artibus et Historiae 16, no. 31 (1995): 58-59, fig. 7, as by Girolamo Mirola. Hackenbroch, Yvonne. Enseignes. Florence, 1996: 124, fig. 133, as Attributed to Dosso Dossi. NGA Board approval October 4, 1984. The title The Standard Bearer was adopted on February 1, 1941; previously, from the time of acquisition, it was known as Portrait of a Man with a Flag. The Latin cross, as distinct from the more familiar eight-pointed Maltese cross, appeared on the battle flag of the order. Today, the white Latin cross on a red field is the flag of the Sovereign Military Order of Malta. The white Latin cross on a red field appears in a near-contemporary series of paintings depicting the 1565 siege of Malta by Matteo Perez, now in the National Maritime Museum, Greenwich. A 1629 engraving by Joseph Furtenbach (Musée de la Marine, Paris) shows one of the order’s galleys bearing banners and flags with the same emblem. Pinturicchio’s frescoes in Siena Cathedral depict Niccolò Aringhieri wearing the emblem on his armor; see H. J. A. Sire, The Knights of Malta (New Haven and London, 1994), 88, repro., and pl. 3. Bernard Berenson, Pitture italiane del Rinascimento (Milan, 1936), 151; Edoardo Arslan, “Una Natività di Dosso Dossi,” Commentari 8 (1957): 260; Edoardo Arslan, Le pitture del Duomo di Milano (Milan, 1960), 33. Copies of undated manuscript opinions by Fiocco and Van Marle are in NGA curatorial files, as is a more tentative undated manuscript opinion by Berenson (“most likely Dosso, though hard to tell in the photo”). Undated manuscript opinion, copy in NGA curatorial files. Felton Gibbons, Dosso and Battista Dossi: Court Painters at Ferrara (Princeton, 1968), 263–264; Francis Richardson, “Review of Dosso and Battista Dossi, Court Painters at Ferrara, by Felton Gibbons,” Art Quarterly 33, no. 3 (1970): 311; Sylvie Béguin, “Nicolo dell’Abate: Étude radiographique,” Annales/Laboratoire de Recherche des musées de France (1971): 59–61; Egidio Martini, “Alcuni ritratti e altri dipinti di Jacopo Tintoretto,” Arte documento 5 (1991): 107 n. 6. Roberto Longhi, Viatico per cinque secoli di pittura veneziana (Florence, 1946), 67; Wilhelm Suida, “Die Sammlung Kress, New York,” Pantheon 26 (1940): 280; Erich von der Bercken, Die Gemälde des Jacopo Tintoretto (Munich, 1942), 118; Rodolfo Pallucchini, La giovinezza del Tintoretto (Milan, 1950), 107; Amalia Mezzetti, Dosso e Battista Ferraresi (Ferrara, 1965), 124; Federico Zeri, “The Second Volume of the Kress Catalogue,” The Burlington Magazine 111 (1969): 456; Burton Fredericksen and Federico Zeri, Census of Pre-Nineteenth-Century Italian Paintings in North American Public Collections (Cambridge, MA, 1972), 201; Sylvie Béguin, “Nicolo dell’Abate: Étude radiographique,” Annales/Laboratoire de Recherche des musées de France (1971): 59–61; Paola Rossi, Jacopo Tintoretto: I ritratti (Venice, 1974), 130–131; Paola Rossi, “Paris Bordon e Jacopo Tintoretto,” in Paris Bordon e il suo tempo: Atti del convegno internazionale di studi, Treviso, 28–30 ottobre 1985 (Treviso, 1987), 29; Paola Rossi, in Jacopo Tintoretto: Ritratti (Milan, 1994), 82; Fern Rusk Shapley, Catalogue of the Italian Paintings (Washington, DC, 1979), 1:462–463. Copies of manuscript opinions by Longhi (1929), Perkins (1932), and Suida (1935) are in NGA curatorial files. Pierluigi De Vecchi listed a Saint George Killing the Dragon in the NGA among the “other works attributed to Tintoretto,” which includes wrongly attributed works; this is presumably the Gallery’s painting. See Pierluigi De Vecchi, L’opera completa del Tintoretto (Milan, 1970), 134, no. C13. The Illustrated Bartsch, ed. Walter L. Strauss, 166+ vols. (New York, 1978–), 44:349, no. 9 (134, The Lovers); 341, no. 1 (130, David Considering the Head of Goliath). See also Valeria Barboni and Enrico Cortina, “A Booklet of Etchings by Giuseppe Caletti,” Print Quarterly 13 (1996): figs. 77, 80. For the anatomical studies, see Barboni and Cortina 1996, 128, 129, fig. 70. John T. Spike, in Baroque Portraiture in Italy: Works from North American Collections (Sarasota, FL, 1984), 84, rectifies the incorrect attribution to Caletti of 14 plates of Ferrarese rulers (Bartsch nos. 11–24). For example, David with the Head of Goliath, David Considering the Head of Goliath, Mary Magdalen (all locations unknown); see Eugenio Riccòmini, Il Seicento ferrarese (Ferrara, 1969), figs. 29, 30a, 30b. The two Davids cited in the preceding note provide the best overall comparisons to the Washington picture among the paintings attributed to Caletti. Early works by Guercino that share a somewhat similar pensive mood with the Washington picture include Et in Arcadia Ego (Galleria Nazionale d’Arte, Rome; 1618–1622) and the Return of the Prodigal Son (Kunsthistorisches Museum, Vienna; 1619). A figure in the latter was adopted for a David in a picture attributed to Caletti (Museo Civico, Ferrara). Altobello Melone’s Portrait of a Young Man (Harvard Art Museum/ Fogg Museum; c. 1527–1528) shows a sitter who similarly looks off into the distance. Infrared reflectography was performed with a Santa Barbara Focalplane InSb camera fitted with an H astronomy filter.